Learn about an early intervening system being developed for young children, called Recognition and Response, designed to help parents and teachers respond to learning difficulties in young children who may be at risk for learning disabilities as early as possible, beginning at age 3 or 4, before they experience school failure and before they are referred for formal evaluation and possible placement in special education. This document describes what is known about an early intervening system being developed for young children (i.e., 3 to 5 year-olds), called Recognition and Response. The Recognition and Response system is an emerging early childhood practice designed to help parents and teachers respond to learning difficulties in young children who may be at risk for learning disabilities as early as possible, beginning at age 3 or 4, before they experience school failure and before they are referred for formal evaluation and possible placement in special education. Support for the concept of early intervening can be found in the reauthorization of the Individuals with Disabilities Education Act (IDEA) and in the Response to Intervention for school-age children. The Response to Intervention (RTI) model for school-age children who are at-risk for learning disabilities emphasizes pre-referral prevention and intervention. RTI can be distinguished from traditional methods of identifying learning disabilities in that it allows early and intensive interventions based on learning characteristics and does not wait for children to fail before providing necessary services and supports. The major premise of RTI is that early intervening services can both prevent academic problems for many students who experience learning difficulties and determine which students actually have learning disabilities, as distinct from those whose underachievement can be attributed to other factors such as inadequate instruction. an integrated data collection and assessment system to monitor student progress and guide decisions at every level. In recent years, a standard treatment protocol — the use of a particular research-based intervention for a small group of children with similar needs — has emerged as an additional RTI practice. the importance of prevention and early intervention. Each of these contexts reflects important factors that must be considered in developing an early intervening system for young children prior to beginning kindergarten. The conceptual framework for the Recognition and Response system is being developed with grant support from the Emily Hall Tremaine Foundation through a collaborative effort that involves the FPG Child Development Institute, The National Center for Learning Disabilities, the National Association for the Education of Young Children, the Communication Consortium Media Center, and key state partners. a series of focused discussions with the collaborating organizations and partners to develop a conceptual framework for the Recognition and Response system adapted from the RTI model. A total of 14 studies met the selection criteria for inclusion in the review and served as the current research base regarding the efficacy of RTI. Analyses included an appraisal of the quality of research methods as well as descriptions of the characteristics of study participants, the nature of the interventions, and methods of assessing student progress and outcomes. The findings suggest that there is an emerging body of empirical evidence to support claims that RTI is an effective method for identifying children at risk for learning difficulties and for providing specialized interventions, either to ameliorate or to prevent the occurrence of learning disabilities. Although there was general agreement across studies about the conceptualization of RTI in terms of its key components and tiered implementation, there was less agreement about the nature and focus of specialized interventions, the duration or intensity of the interventions, and the benchmarks used to determine when more intensive interventions were needed for individual children. Despite these limitations, the research synthesis findings suggest that RTI is a promising approach, particularly because of its focus on sound instructional principles such as effectively teaching all children, intervening early, using research-based interventions, monitoring student progress, and using assessments to inform instructional decision-making. The proposed Recognition and Response system is based on the premise that parents and teachers can learn to recognize critical early warning signs that a young child may not be learning in an expected manner and to respond in ways that positively affect a child's early school success. In the Recognition and Response system, there is limited reliance on formal diagnosis and labeling. Instead, the Recognition and Response system emphasizes a systematic approach to responding to early learning difficulties that includes assessing the overall quality of early learning experiences for all children and making program modifications, tailoring instructional strategies, and providing appropriate supports for individual children who struggle to learn. a collaborative problem-solving process for decision-making. 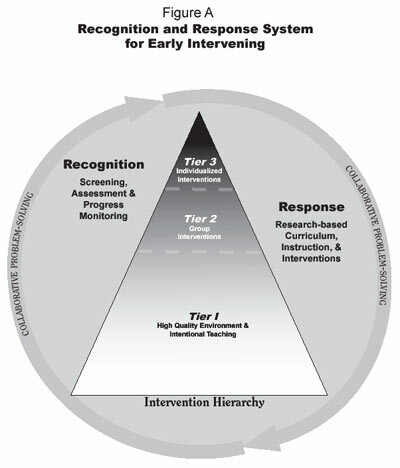 Future efforts should focus on further developing and evaluating each component as part of an integrated system, particularly with respect to identifying the specific assessment and instructional strategies within each of the tiers in the intervention hierarchy. Figure A shows the four components of the Recognition and Response system. An intervention hierarchy reflects increasing levels of intensity of instruction and intervention that correspond directly to children's needs for support. A teacher's decision to move from one tier to the next is guided by screening and assessment information as part of a systematic and collaborative problem-solving process that includes parents and specialists. An integrated assessment plan that relies on multiple methods and sources of information (e.g., observation, checklists, work sampling, curriculum-based assessments) can be used to determine which children are meeting key benchmarks, which children are in the process of developing these skills, and which children are not making adequate progress. The overarching goal of the Recognition and Response System is for teachers to use assessment as part of an integrated instructional system to make improvements in the general early childhood program and to plan focused interventions for children who require additional supports. Future efforts should focus on identifying standard research-based interventions that would comprise a "toolkit" from which teachers could extract specific practices to respond to individual learning characteristics within each tier of an intervention hierarchy. Key to the problem-solving process is the use of assessments to inform decisions, thus, creating a dynamic link between the recognition and response components. The problem-solving process is collaborative, systematic, and used by teachers, parents, and specialists to make decisions about practice and to evaluate their effectiveness for individual children. Further develop the Recognition and Response system by (a) specifying in more detail each of the four components (i.e., an intervention hierarchy; screening, assessment, and progress monitoring; research-based curriculum, instruction, and focused interventions; and a collaborative problem- solving process for decision-making) and (b) creating the tools and resources related to implementing each component. Evaluate the efficacy and effectiveness of the Recognition and Response system through future research. Use professional development as the primary vehicle for disseminating information about the Recognition and Response system to front line early childhood professionals—teachers, specialists, and administrators. Develop and evaluate dissemination strategies (consisting of print, electronic, and oral presentation methods) to communicate information about the Recognition and Response system with a wide audience that includes parents of young children, researchers, policy makers, and the general public. Develop (or adapt) existing public policies related to program standards and professional competencies to support the widespread adoption and implementation of the Recognition and Response system throughout various sectors of the early childhood field (e.g., child care centers and homes, public and private pre-k programs, Head Start). Coleman, M.R., Buysse, V. & Neitzel, J. (2006). Recognition Response: An early intervening system for young children at-risk for learning disabilities. Executive summary. Chapel Hill: The University of North Carolina at Chapel Hill, FPG Child Development Institute.